130 MMS September 2017 mmsonline.com TOOLING AND WORKHOLDING The three-edge BR30 has a short, rigid design and differential pitch. 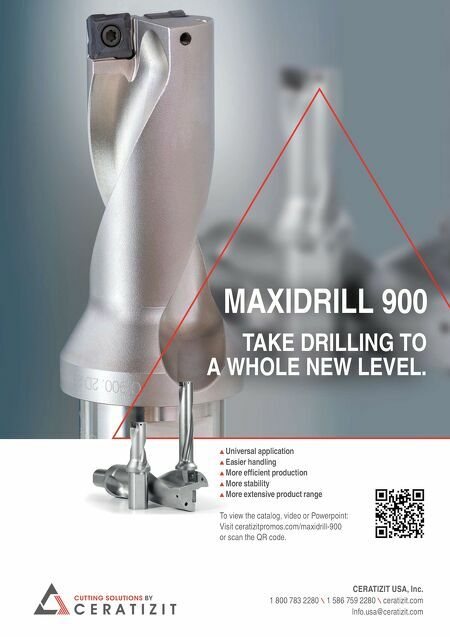 Sandvik Coromant Inc., call 201-794-5000 or visit sandvik.coromant.com. TROCHOIDAL END MILLS INCREASE METAL REMOVAL RATES Emuge announces its line of solid carbide end mills for trochoidal mill- ing. The company says the end mills increase m e t a l r e m o v a l r a t e s over 30 percent, reduce tool paths, extend tool l i f e a n d e n a b l e a x i a l depths cuts as high as 4×D. They optimize the c a l c u l ati o n of m i l l i n g paths and avoid unpro- ductive tool motion for advanced milling strat- egies in CAM software. The end mills feature variable spacing, vari- able helix angles and improved micro-geom- etries for low vibration, as well as TiN/TiAlN or A l C r c o a t i n g s a n d a submicron-grain carbide s u b s tr a te. T h e c h i p - b r e a k e r g e o m e t r y reduces a xial pull-out force and minimizes chip buildup in pockets, since the small chips can be r e m o v e d w i t h c o m - pressed air or coolant. T h ey a re ava ila bl e i n t w o g e o m e t r i e s : Jet-CutTM for roughing a n d f i n i s h i n g s t e e l , a n d c o o l a n t-th ro u g h TiNox-CutTM for rough- ing of tough materials. Emuge Corp., call 800-323-3013 or visit emuge.com. 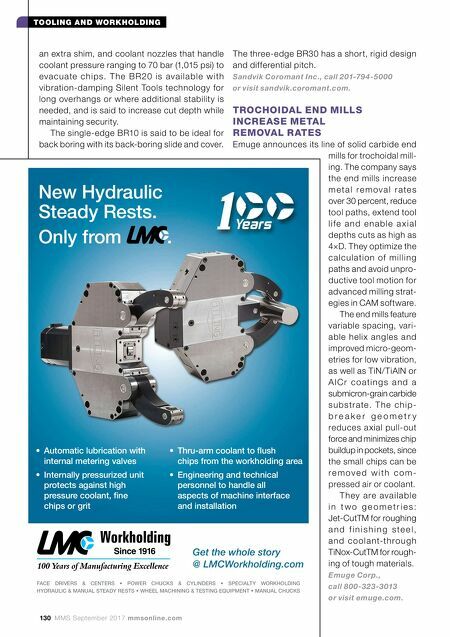 New Hydraulic Steady Rests. Only from . • Automatic lubrication with internal metering valves • Internally pressurized unit protects against high pressure coolant, fi ne chips or grit • Thru-arm coolant to fl ush chips from the workholding area • Engineering and technical personnel to handle all aspects of machine interface and installation FACE DRIVERS & CENTERS • POWER CHUCKS & CYLINDERS • SPECIALTY WORKHOLDING HYDRAULIC & MANUAL STEADY RESTS • WHEEL MACHINING & TESTING EQUIPMENT • MANUAL CHUCKS Get the whole story @ LMCWorkholding.com an extra shim, and coolant nozzles that handle coolant pressure ranging to 70 bar (1,015 psi) to eva c u ate c h i p s. T h e B R 20 i s ava i l a b l e w i th vibration-damping Silent Tools technology for long overhangs or where additional stability is needed, and is said to increase cut depth while maintaining security. The single-edge BR10 is said to be ideal for back boring with its back-boring slide and cover.